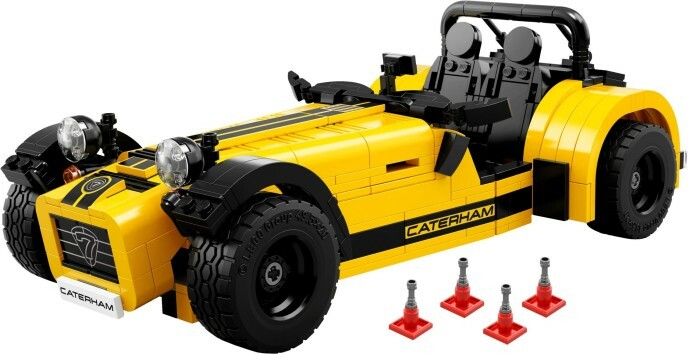 Leaked images of 21307 Caterham Seven 620R have been available for a couple of weeks but the set has finally been officially revealed on the LEGO Ideas blog and at a media launch event today. The wait is over! We have been polishing this yellow and black beauty all night so that we could finally present to you the first official images and details of the LEGO Ideas 21307 Caterham Seven 620R! Measuring in at 771 bricks distributed across 3” (10cm) in height, 11” (28cm) in length and 5” (14cm) in width, this Caterham contains stunning details to reproduce that awe inspiring Caterham look. This LEGO Caterham is racing to a store near you with availability from the 1st of October, 2016 for a recommended retail price of USD 79.99 / EUR 79,99. Create a LEGO version of the Caterham Seven 620R, a custom-built sports car with an unashamed old-school vibe. Power steering? No chance. Electric windows? Forget it. The Caterham Seven is definitely not for the faint-hearted—luxury is for wimps! Remove the nose cone, engine cover or engine to take a closer look at the authentic details of a LEGO model that’s for true car connoisseurs only. struck a chord in my heart that I never forgot”, Carl Greatrix a.k.a. bricktrix_Carl explains as he talks about his love for Caterham cars. An official UK price has not been announced but I expect it will cost in the region of £69.99. I think it looks fantastic but are your impressed? Let us know in the comments below. Ooh, that's not too shabby. I curious of the price in the UK, I just hope it's price is less than the 10248 - Ferrari F40 and 10252 -Volkswagen Beetle. With 400-500 pieces less than previous two Creator Expert vehicles it should be, I'm hoping for £49.99 or £54.99. I too am not sure about the RRP mentioned. The UK/EUR & US price is never the same value, so hopefully a bit cheaper than stated in the UK/EUR. Very cool, but there's no interest in the subject matter for me so it's a pass. I'll definitely be getting one. I think I preferred the green and yellow colour scheme of the original Idea project but it's still a great model I'll definitely get. I've said it before when the first pictures were leaked, there's something wrong with the proportions. The hood is a few plates taller than in the original design. That bit of yellow you see just behind the front wheel also looks odd. Not mad about the colour either but all the other 620R colours were already 'taken'; dark green for the Mini, azure blue for the Beetle, orange for the Porsche. When I first saw the yellow color scheme in the images that were leaked a couple of weeks ago, I didn't really like it, but I must admit that it has really grown on me! Looks like I'll be continuing my streak of owning every IDEAS set! Great job Carl and Henrik! Slightly confused - I'm organising the Caterham Model Show (which is on the 17th, not today), and no one has mentioned anything to me about the Caterham Seven being revealed at the show (unless I'm not being told about it? I did try asking, since I thought it might be a good connection, but no one responded!). Regarding Duq's post: It would be nice if Carl analysed the changes made by Lego to his Idea submission, like Jason did for his Maze. While I don't have a lot of interest in cars of any kind (so I'll probably skip this one), I love this for all those yellow slopes and pieces and tiles and things. Thumbs up for that. @Harlquinth - Sorry for the confusion. A media launch event is taking place today and I had muddled it up with the Caterham Model Show at the weekend. Neat car, but I'm not sure many Americans will recognize the brand. Curious to see how sales will be in the states. Ill definitely get this. Would love to use dark green parts to build a second. It's a gorgeous model, I just don't have the interest or spare cash to warrant the purchase. But I won't deny it looks great. The proportions are a little off (not wide enough at the back, wheels too big) and there's a small gap in the bonnet where the angled side has to meet up with a straight edge on the top, but I still like it. I'm not sure I'll get this, but I'll think about it (it meets my criteria of 'fast car'. just not my criteria of 'fast car I really liked as a teenager and so I'll rose-tint my memory of it'). My biggest concern is that they dropped the steerable wheels! All of the official pictures have the front wheels straight ahead. Clearly Carl's original model had steering linkage. Being more of a Technic fan these days, loosing the steering - particularly in an open wheeled car like this - could be a deal breaker for me. That would be quite frustrating as I was really looking forward to this one. For the record U.S. here, but a big car enthusiast so not sure I speak for the general U.S LEGO demographic. Also agree with others that the original yellow/green color scheme was better and that the proportions dont seem as accurate on the official set - almost like they smushed it from each end. I feel this would look better if the front fenders were the same color as the rest of the body. Great car but I'm waiting for the Apollo 11 Ideas model . . . anyone have a guess when that will be released? Looks great! From read a comment above it is possibly a bit of a disappointment that they dropped the ability to steer however not surprising as this feature usually only exists in Technic. Perhaps its time to mix it up a bit more TLG. Most definitely get one regardless as it still looks pretty cool. Would have been nice to see something a bit more done with the wheels, they look very plain and the profile is a bit too high. The Creator Ferrari F40 wheels with a different insert would have been better I think. But otherwise this is probably the most faithful recreation of an Ideas project so far, it's almost unchanged from the initial idea. I think I'll pick one up when it becomes available. The design looks great and this looks like a really cool vehicle. However the lack of steering shifts it to no-buy zone for me, especially since it sounds like the original Idea actually had steering. For me, vehicle sets at this [price] level in the Ideas and Creator sets should have steering (imho). Again though, really good looking set. This will look great with the Creator cars. WOW! All pieces are printed! Even the hardly visible break dishes! That's crazy! Beautiful vehicle all around! Love it! Looks fantastic; going straight on my 'want' list! Not sure why there are all the complaints about the lack of steering as the camper van, mini cooper, Ferrari and beetle don't have steering either. This is a display piece, not a Technic model. On a more meta level, it's interesting and in a way heartening that the size and price point of Ideas sets keeps edging upwards (Maze was the first $70, 700+ piece set; this is the first $80 set and has even more bricks). That means Lego has increasing confidence in the Ideas pipeline and its ability to sell larger sets to the masses, which means we're more likely to get a properly huge ($100+) Saturn V set and increases the likelihood of larger, move involved sets in future review periods. ... but not by LEGO. Have a look at https://ideas.lego.com/projects/87703/updates where you can see that the 22nd Dec revision is much closer in shape to the current http://brickset.com/sets/21307-2/Caterham-Seven-620R model than the original, more complex, submission. Now, how many people were voting on the original photos of 4th December and expecting _that_ model to be produced, instead of (one of) the revised models? I kinda dislike that colour scheme. I would have much rather they chose the green or the blue. It looks good though! Somehow this will be mine during the London bus promotion. For those complaining that it's not like the original model, the fact is that the original used loads of 'illegal' and fragile techniques which Lego would never put into an official model, so it had to change. I do like it, and will definitely be getting it, but I agree with what others have said about the colours...probably the least appealing 620R scheme. Also the front grill doesn't look quite right to me. Will still be handing over my cash though. As a Brit it's great to see such a specialist British manufacturer recognised in such a way. Looks like a cool set, but I still consider this an incredibly ugly car. All pieces are printed... Which means you can't take the side logos and stripes from the set and make another 7 in a different colour without having a yellow background on those bricks. For once stickers would have been good! OMG, must have... looks great!!!! Well done!!!! @Caterham7: Even if the parts had been stickered, the set would probably only have included stickers designed for a yellow model. So if you would have to design new stickers for a differently colored model anyway, I don't see the issue with the parts in the set being printed. Aw, green and yellow is nicer. Still, a day one purchase. This might be good enough to make it my first Ideas purchase! Just one slight issue - British car, no British price. @The Rancor, Perhaps the reason there's no UK price yet is that TLG is still doing market research to see how much more UK consumers are willing to spend because it's a British car. This looks like it should go great with the Mini Cooper and F40! I think I know what I'm buying myself for Christmas this year. All I see are 90 degree exhaust pipes in black. Yes please. No steerable wheels is a shame. Has lost more fidelity than I was hoping for in the transition to an actual set but to be expected. This was not one of my original picks from the Lego Review, but I think this looks great! I hope to get it sometime! For sure will be picking up one of these! Lovely looking model of an iconic car. @CapnRex101 - The following video confirms the UK price of £69.99.